How do the new Sierra V-Crown bullets stack up to the bullet maker’s traditional jacketed hollow points? The hollow point handgun bullets are named V-Crown, and are offered in most common calibers: .380 Auto, .38 Special, 9mm Luger, .357 SIG, .357 Magnum, .38 Super +P, .40 S&W, 10mm Auto, .44 Special, .44 Magnum, .45 Auto and .45 Colt. 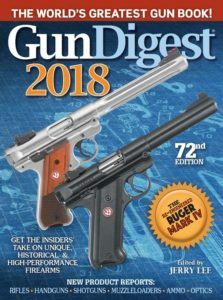 Some calibers offer several bullet weights: The 9mm Luger has 115-, 124- and 147-grain bullets; the .40 S&W has 165- and 180-grain bullets; and the .45 Auto has 185-, 200- and 230-grain bullets. V-Crown ammunition is described thus: “The ultimate defense round delivers exceptional on-target energy, maximum weight retention, and optimal expansion at all effective distances.” The bullets have a stacked hollow point design with an additional hollow cavity. A unique toothed cannelure acts to ensure weight retention and excellent expansion. V-Crown bullets are made by Sierra for SIG’s defensive ammo, and some versions for common semi-automatic pistol cartridges have now been made available for handloaders. These include 90-, 124- and 125-grain .355-inch bullets; a 165-grain .400-inch bullet; and a 200-grain .4515-inch bullet. The 90-grain .355-inch bullet lacks the cannelure. V-Crown bullets are a new design, and most of them have a distinctly different shape than Sierra’s traditional line of JHP bullets. Traditional Sierra JHP bullets have a truncated cone nose shape, whereas most of the V-Crown bullets have a curved nose. The exception is the 90-grain .355-inch bullet, which retains the conical nose shape. The hollow point cavity of the Sierra V-Crown is also distinctly different than the company’s usual JHP. The traditional Sierra JHP bullets have a wide and deep hollow cavity with a flat bottom, rather like an ashtray. The V-Crown hollow cavity has sloped sides that look like they were formed with an inverted cone. The cavity leads to a small hole at the center penetrating deeper into the lead core. The 124- and 125-grain bullets differ in an interesting way. The lighter 124-grain bullet is longer than its heavier 125-grain sibling. The nose shapes are different. The 124-grain bullet has a longer, more gradually tapered nose that would be typical of a 9mm Luger bullet. The 125-grain bullet has a shorter nose that is likely designed with the .357 SIG in mind, and it looks like the same bullet loaded in my sample of the company’s .357 SIG ammunition. SIG also loads a 125-grain bullet in its .38 Special, .38 Super and .357 Magnum ammunition. I checked my box of SIG V-Crown .38 Super ammunition to see if it was the same 125-grain bullet as the .357 SIG. However, the .38 Super’s bullet does not look like the SIG bullet. Instead, it looked like the 9mm bullet with a longer nose. I pulled the .38 Super bullet, and it weighed 124 grains, not 125 grains like it says on the box. Oh well, close enough. The nose of some V-Crown bullets appears to be a little longer than Sierra’s usual JHP bullet, which means the V-Crown can be seated to a slightly longer overall length. The benefit of a longer nose means more options for overall length. A short nose often means a short cartridge overall length for some calibers because the bullet will contact the rifling if loaded near the cartridge’s maximum overall length, so the bullet must be seated deeper to allow it to chamber. Some guns are finicky when feeding short-loaded bullets, so the longer nose of some V-Crown bullets means they can be loaded longer which can improve feeding reliability. The length and weight of V-Crown bullets were compared to the lengths of other Sierra bullets. Sierra does not make a 200-grain .45-caliber JHP at the present. The company’s current 200-grain bullet is a jacketed flat point (JFP). Sierra’s bullets have an excellent reputation for accuracy, and I wondered how this new design compared accuracy-wise with older designs. I compared them, where possible, with the same weight Sierra JHP bullets. For the 200-grain .45-caliber bullets, I used Sierra’s 200-grain JFP. I loaded them up and fired a 10-round group at 25 yards with the pistol mounted in a Ransom Rest. Velocity was measured with a Shooting Chrony chronograph at about 10 feet from the muzzle. The test guns were a Para Ordnance P14-45 for .45 Automatic, a Para Ordnance high-capacity frame with a Caspian slide and Ed Brown 5-inch barrel for .40 S&W, a Colt Government Model .38 Super and a Glock 19C for 9mm Luger. The V-Crown 90-grain bullets are intended for a .380-caliber pistol, but I did not have one suitable for these tests, so I tested them in the 9mm Glock. None of these pistols would be considered fully “accurized.” The .40 S&W pistol has a custom top end, but the slide and frame fit was not tightened, and the Ed Brown barrel was a “drop-in” type. The Colt .38 Super had the bushing replaced because the factory bushing was a little loose. The Para Ordnance P14-45, and the Glock 19C are stock guns. The group sizes with the 9mm and .40 S&W V-Crown bullets were a little smaller than their JHP counterparts. The .38 Super loads with both V-Crown bullets were slightly larger than the group with the standard JHP. The two Sierra 200-grain .45 Automatic loads produced the same group size. They were not the smallest groups, but this is about the best that this particular barrel/gun can shoot. These new V-Crown bullets appear to have the same accuracy potential as Sierra’s standard line of bullets, which is a high bar to meet. I asked Sierra if the company planned on making the other calibers and weights of V-Crown bullets available to reloaders in the future. They replied that they might introduce some this year. V-Crown bullets cost just a little more than Sierra’s standard JHP bullets. It’s nice to have premium bullets available as a component. Handloaders can now duplicate SIG factory ammunition, or load the same bullet to suit their needs. V-Crown accuracy was on par with the other Sierra bullets in my pistols, so they are certainly worth trying in yours to see how they perform. Editor’s Note: This article is from the July 2016 issue of Gun Digest the Magazine.